Hi Everyone! 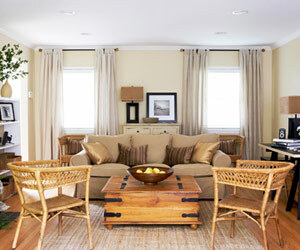 I came across this Better Homes and Garden makeover with a video series that goes with it. I thought that this might be very educational for those of you that aren't so design savvy, yet yearn for a wonderful space that your family can call their own. Designer Stephen Saint-Onge takes you through his thought process in converting this room that has a lot of potential into a great gathering space for only $600. He has some great bones to work with (I love the fireplace and bookcases) and shows you how to make the most of the space. He re purposes some of the furniture and uses some vintage touches along the way. I hope you enjoy! Here's a before and after of the space. 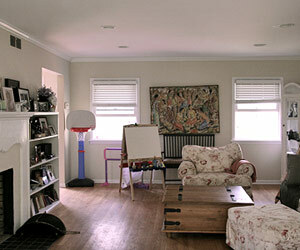 I have a coffee table like the one in the above photo in my family room. I love the storage because I use it to store pillows and blankets for getting cozy on the sofa. However, I am very bored with the look. I have been thinking about painting it to freshen it up? Do any of you in blog land have any other great ideas of how you would change the look of this coffee table? If so, please comment because I would love to hear your ideas. Have a fabulous Wednesday! I thought you'd never ask! :) One of my great creative passions is to hand paint furniture. I see from some of your posts, you enjoy it too! My mom has this same coffee table... I love one brightly colored accent in a room full of neutral's. Orange, Turquoise, Red, and Green all come to mind for a table like this. You could even do a large crackle effect to keep it on the rustic side... Or you could just GO WILD and paint it all in Zebra BROWN AND WHITE with a warm oak stain wiped over the top for an aged look as well... Animal prints are classic and always liven up a room! Toss in some some new throw pillows and you've got a whole new look! Pop over and see some of my re-do's under the Creative Recycling tab for more inspiration! Good luck with your table! p.s. I would leave the hinges the color they are, or you could rusty them up a bit by sponging some burnt sienna craft paint on them..! I have a rectangular blanket box that goes at the end of my bed that looks similar to this...I was thinking of sewing a cover with foam wadding & tufting to make it look like a tufted ottoman!! !